Set to air November 10, the program – hosted by Red Hot Chili Peppers drummer Chad Smith – mixes interview material with the group’s July 10 show at the ancient Acropolis theater, which was built in 161 AD. "We've done some crazy things over the last 20 years,” says Dave Grohl, “but I think this might be the craziest thing the Foo Fighters have ever done." Captured in legendary destinations around the globe, the “artist-driven concert series” bills itself as being “as much about landmarks, as it is the music and the musicians who perform” on the program. 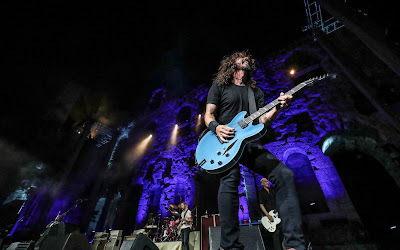 Currently on the road in support of the recently-released "Concrete And Gold" album, the Foo Fighters have just announced the first series of dates for a 2018 tour of North America. A spring run will begin in Austin, TX on April 18, with shows running to early May, following which the group will begin a European trek in June.